In 1981, when designer Pierre Cardin purchased the famous Maxim's restaurant on the Rue Royale in Paris, he was already dreaming of opening several more across the planet - each one with cuisine every bit as lavish as the Art Nouveau ornamentation and furniture within. With branches now in New York, London and Beijing, the Maxim's empire has become a string of culinary institutions, a hotel and a museum. 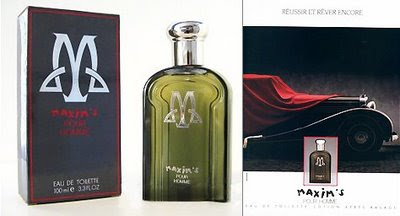 In 1988, Cardin teamed up with bottle designer Pierre Dinard, and created the wonderful Maxim's Pour Homme - a lush floral fougere that embraced the Art Nouveau design ethic of highly stylised flowing organic lines and forms. The scent itself can, in hindsight, be characterised as being very 80's in style... full-bodied and excessive, much like other colognes of its time. But this fragrance, now regrettably discontinued, can still hold its own alongside other 80's greats such as Chanel's Antaeus and YSL's Kouros, when pitted against many modern mainstream releases. A exuberant opening of wet lavender and lush fruits blossom on the skin over a mildly indolic heart of jasmine, sharp muguet and peppery carnation. There is also an unmistakable core of mossy cedarwood and sandalwood that act as the framework for this scent. The basenotes are characterised by dark patchouli and musk accords that dip and dive between the ornate leathery pillars that hold the roof of this composition aloft. On paper, the individual elements might appear to be an erratic assortment, but after 20 or 30 minutes on the skin, there is a wonderful synthesis of these accords that work phenomenally well together. If I were to find fault in it, perhaps its only short-coming is in its longevity, which is approximately 4 hours on my skin. ... I can only hope that it too is resurrected on some distant day, and celebrated in the same way the Art Nouveau themes have been, in Cardin's opulent eateries. May I just say I love your blog? I found you through Tamara's last entry and have spent many happy hours browsing your beautifully written posts. Wonderful to have found you! I am not surprised this is a powerhouse scent... I love Cardin and it seems he never was shy with his creations. So many bear the mark of the '80s. Have you smelled Enigme? I'd love to hear your thoughts.